“Freezer” is like a refrigerator at someones home who suffers from bulimia. Empty and cold. Don’t expect panoramic images, because the whole film is set in an enclosed area of a few square meters. You only get a few glimpses of other locations in the beginning of the film and in the end. For the rest it’s a desolate view of the inside of a cooling room with some hunks of meat hanging from the ceiling and also a whole range of iron shelves with boxes. And strangely enough, in between an infiltrator comes crawling out of a shelf where he was tucked away for some time. But that’s the last thing I will tell you, otherwise there’s nothing left from this unlikely, farfetched thin story. When a complete movie takes place in one specific area, then it can only be successful by using a surprising twist in a clever put together story that takes you by surprise. A movie like “Devil“, which is almost exclusively set in an elevator, was equipped with such an original story. “Freezer” is a total failure in this part and the denouement is really exaggerated and farfetched. Well it didn’t warm me up. How appropriate! 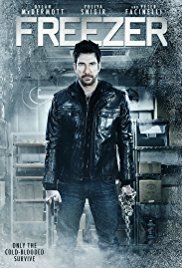 Robert (Dylan McDermott) is the unfortunate mechanic who awakes in a cooling room, with a plastic bag over his head and his hands and feet tied with straps. He has no idea where he is, but soon realizes it’s terribly cold in there. After a while two sturdy guys come in who start beating him up. Robert realizes that something is not quite all right and that he’s in an awkward and difficult position. Usually you’ll come to that conclusion after you get a hard punch in your stomach and you find your lunch spread all over the floor. The Russian tough guys know only one English word: “Money”. Apparently they are seeking for 8 million dollars they’ve lost. And they claim that Robert has pinched this considerable sum of money. What follows is a fairly monotonous routine in which the two Russian mobsters disappear and reappear. Soon after they are also accompanied by a Russian tough lady called Alisa (Yuliya Snigir), who seemed to be quite superior at first, but afterwards appeared to be just another third-rate accomplice. Between these interludes Robert tries to save himself out of this situation and starts to search for a possible escape route. If I were him, I would have emptied the fire extinguisher unceremoniously in the face of the gangsters at the time they walked into the freezer and subsequently crush the empty fire extinguisher on their Russian heads. I guess the cold hindered the ability to think. The story itself is already wafer-thin. So what about the performances? About the gangsters we can be short and concise. Ultimately they are just mindless hulks and that’s how they perform. Plain stupid. Yuliya Snigir was very convincing in the beginning but then the overacting arose and it soon changed into a sad spectacle. The only one who could get my approval was Dylan McDermott. Allthough his situation looked desperate, he tried to pervade it with subtle and humorous conversations. But that didn’t save the movie. He did save his face though. An admirable performance in a meaningless movie. I think he really looks like David Schwimmer (Ross from the sitcom “Friends”). It reminded me of that episode where Chandler got stuck in an ATM vestibule. But that’s aside. There were also some rarities in this movie that left some questionmarks. Apparently this cold room was already used before. Wouldn’t it be appropriate to remove some dangerous items such as meat hooks and a fire extinguisher ? And apparently it wasn’t that cold in there because there were no freezing phenomena. Not even a little cloud in the air as they were speaking. And after removing his shoes, Robert had difficulties to stand on his feet because of the so called freezing cold. Seems that plastic brings salvation ? And afterwards, although the temperature was even lower, it didn’t look like it bothered him. And how you can make a glowing stove with only two electrical wires and an iron rack, remains a mystery to me.